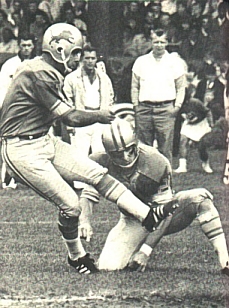 Soccer-style placekickers were still a novelty in 1966 when Garo Yepremian joined the Detroit Lions. At 5’7” and 160 pounds, he was significantly undersized and had no background in the sport. The left-footed former semipro soccer player from Cyprus had, in fact, signed with the Lions just six weeks after arriving from London to visit his brother in Indianapolis, and had never seen an American football game prior to that. But on November 13, 1966 against the Minnesota Vikings he had a record-setting day in his new profession. The Lions, coached by Harry Gilmer, started off the season with two wins in their first three games but had gone winless since (including a tie the week prior to the Minnesota game) and were a dismal 2-6-1. Adding to their problems, QB Karl Sweetan, who had taken over the starting job after veteran Milt Plum went down with an injury, was himself playing with broken ribs suffered the week before against the Bears. Minnesota was 3-4-1 coming into the game, having won three of their previous four contests following a slow start. Head Coach Norm Van Brocklin’s team was suffering from inconsistency, not helped by conflict between the coach and starting QB Fran Tarkenton. There were 43,939 in attendance at Metropolitan Stadium in Bloomington, Minnesota. In their first possession, the Vikings went 73 yards in 14 plays but the drive stalled at the Detroit 7 and they settled for a 15-yard Fred Cox field goal. Shortly thereafter, SS Dale Hackbart intercepted a pass by Sweetan and returned it for a touchdown that, with the successful extra point, made it 10-0. Yepremian, who had connected on just one of his six field goal attempts since joining the team, missed his first attempt from 48 yards. However, he found the range in the second quarter. The Lions had drives of 50, 52, and 51 yards, respectively, to set up each of Yepremian’s first three field goals, from 33, 26, and 15 yards. Just before the end of the first half, LB Mike Lucci intercepted a Tarkenton pass and returned it 16 yards to the Minnesota 13. Yepremian kicked his record fourth field goal of the quarter, from 20 yards, and the Lions went into halftime with a 12-10 lead. The Vikings turned things around in a two minute span of the third quarter with help from the defense. First, FS Ed Sharockman intercepted a pass by QB Tommy Myers (who had come in for one play in place of Sweetan) and returned it 38 yards to set up a two-yard scoring carry by HB Dave Osborn. On the next series, DE Jim Marshall forced a fumble by Sweetan that was recovered by LB Roy Winston at the Detroit 12. FB Bill Brown scored from that distance and the Vikings were up by 24-12. Yepremian missed a 39-yard field goal attempt in the third quarter, but shortly thereafter got another chance after Lucci again came up with an interception. This time he was successful from 28 yards to tie the existing NFL record for field goals in a game as well as narrow Minnesota’s lead to 24-15. Following another interception of Tarkenton, this time by safety Tom Vaughn, Yepremian added his record-breaking sixth field goal from 32 yards. The diminutive Cypriot had thus far accounted for all 18 points scored by the Lions and it was now a six-point game. In the fourth quarter, Lucci struck again, intercepting Tarkenton for the third time and on this occasion returning it 53 yards for a touchdown. With Yepremian’s successful extra point, the Lions were back in front at 25-24. Soon afterward, DB John Robinson returned a punt 64 yards for the Lions to set up another touchdown. HB Bobby Felts, replacing the injured Amos Marsh, powered in for the three-yard TD and Yepremian added another extra point to improve Detroit’s margin to eight points. With 2:42 left, the Vikings finally got on the board again. They drove 71 yards in 10 plays that ended with HB Billy Barnes running for a three-yard touchdown. Minnesota had one last shot, taking over with 1:01 on the clock, but couldn’t reach field goal range and ended up turning the ball over on downs to effectively end the game. Detroit won by a final score of 32-31. The Lions had the edge in total yards (268 to 232) and first downs (16 to 15). Detroit failed to run the ball effectively, gaining just 50 yards on 22 carries, while the Vikings managed only 83 net passing yards. There were nine turnovers in all, with Minnesota accounting for five to four by Detroit. Garo Yepremian had the biggest day, setting a then-league record with six field goals in eight attempts, including four in one quarter. The six field goals broke the previous NFL record of five that had been held by four players (Ernie Nevers, Bob Waterfield, Roger LeClerc, and Jim Bakken, who would in turn exceed Yepremian’s mark). Karl Sweetan completed 24 of 41 passes for 226 yards with no touchdowns and one intercepted. Flanker Pat Studstill had 9 catches for 116 yards. FB Tom Nowatzke led Detroit’s anemic running attack with 18 yards on 10 carries, although he caught 5 passes for 35 yards. Mike Lucci (pictured at left) was the star on defense with his three interceptions, including one returned for a touchdown. Fran Tarkenton had a rough outing for the Vikings as he was successful on just 11 of 24 throws for 106 yards with no scores and five interceptions. Bill Brown led the rushers with 45 yards on 13 carries that included a TD and Dave Osborn added 39 yards and a score on 16 attempts. Brown also was the top receiver with three catches for 17 yards. TE Preston Carpenter gained 40 yards on his two receptions. Detroit won again the next week with an upset of the Colts but lost the remaining games, including the rematch with the Vikings. Both clubs finished at 4-9-1 and at the bottom of the Western Conference. Garo Yepremian ended up kicking 13 field goals in 22 attempts (59.1 %) and was successful on all 11 of his extra points. 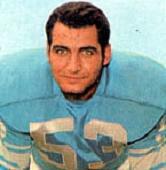 He returned for the 1967 season but entered the US Army and was let go by the Lions. After a stint in the Continental Football League, Yepremian caught on with the Miami Dolphins in 1970 and went on to have an outstanding career that finally came to an end with Tampa Bay in 1981. Overall, the unlikely-looking football player who had been ridiculed when he first joined the Lions for his lack of knowledge of the game ended up kicking 210 field goals out of 313 attempts (67.1 %) and 444 extra points for a total of 1074 points. He also was twice selected to the Pro Bowl and received All-NFL honors on two occasions. While his single-game field goal record didn’t last long – it was broken by Jim Bakken of the Cardinals in 1967 - the four field goals in a quarter remain a record, tied several times.